CIF catalogs work well for catalogs that do not change very often. A supplier that sells specific products that pricing or product descriptions do not change is a good candidate for a CIF catalog. The catalog can be updated several times per year and a full punchout catalog may not be needed. Punchout offers many advantages over CIF catalogs. The first advantage is control over product pricing and inventory. When a new product is added or a product is discontinued it can simply be dropped from the Punchout catalog. With a CIF catalog the entire catalog would have to be replaced. Another advantage of a punchout catalog is flexibility. Often times your buyer does the loading of CIF catalogs so you are reliant on their loading schedule. It may take days or weeks to load the catalog changes. By eliminating the time spent manually typing orders, your customer service team become more efficient and order entry errors are virtually eliminated. 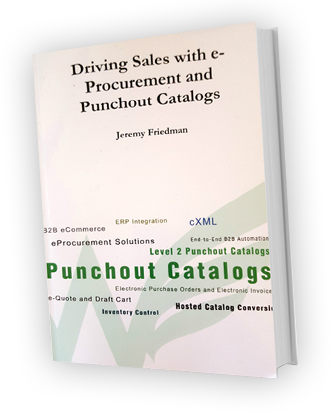 Punchout catalogs can help streamline your ordering or fulfillment process. Your punchout catalog can be connected to your financial or ERP system to streamline your operations. When a buyer places an order and an electronic purchase order is issued, it can be directly injected into your ERP system for fulfillment. When your finance department is ready to invoice the order, a cXML invoice can be triggered directly from your financial system.